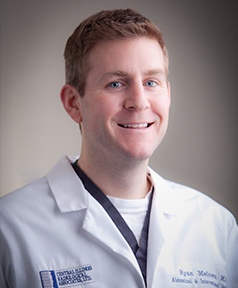 Central Illinois Radiological Associates » Interventional Radiology Clinic » Ryan Meiners, M.D. Dr. Meiners received his medical degree from Northwestern University College of Medicine, Chicago, Illinois in 2001. After graduation, he continued his medical training and went on to complete a Transitional Residency from 2001 to 2002 and a Diagnostic Radiology Residency at Aurora St. Luke’s Medical Center at Milwaukee, Wisconsin from 2002 – 2006. Dr. Meiners then continued his Medical training and went on to complete an Abdominal Imaging Fellowship at University of Wisconsin Hospital at Madison, Wisconsin from 2006 – 2007. Dr. Meiners is board certified by the American Board of Radiology. He maintains memberships to numerous professional organizations including, American College of Radiology, American Board of Radiology, Radiological Society of North America, American Roentgen Ray Society and the Illinois State Medical Society. Dr. Meiners specific interests and skills are in musculoskeletal imaging. He has had additional training and performs interventional oncology, specifically cryoablation and microwave ablation. Dr. Meiners is also accredited for interpretation of CT coronary angiography and CT colonography. Dr. Meiners joined Central Illinois Radiological Associates in January 2009.